The Prism Micron has a carbon frame ,"ripstop" nylon sail and comes with a set of 23kg\50lb x 15m\50ft braided Spectra lines, fingerstraps and a tail. It is 980mm wide and 410mm high. 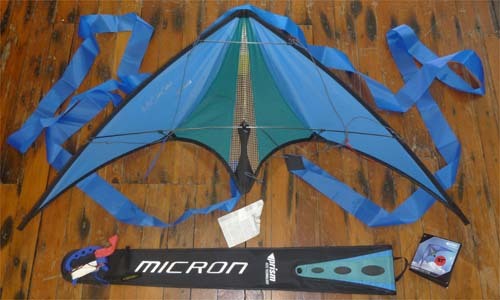 This is one of the smallest fastest stunt kites you can get and is a challenge to fly without the tail to slow it down.